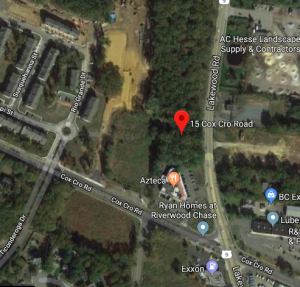 A plan for a 10-acre Route 9 parcel to become multi-family homes, a convenience store with gas station, medical office and commercial space known as Cox Cro Crossing is again scheduled for its hearing before the township planning board. Held over from the March 21 meeting, the preliminary and final major site plan with variances was rescheduled for the April 4 meeting. The site is at 2124 Lakewood Road and 15 Cox Cro Road, which is the parcel near the Azteca restaurant and the recently built Riverwood Chase neighborhood. Cox Cro Crossing has been on the agenda before, with its application deemed complete last summer and advertised for the October 2017 agenda. Another project owned by Nobility Crest, Cox Cro Crossing would include two buildings comprised of 42 apartments — one, two and three bedrooms. There is also 32,204 square feet of general office space, 21,619 square feet of retail commercial space, a 10,000 square-foot medical office space, and 5,496 square feet for convenience store/gas station. The Cox Cro Crossing site plan needs bulk variances for several things, including its plan to have zero feet of buffer between a residence and a nonresidential use. There’s also four stories proposed, where three stories tall is allowed. A variance is needed for the parcel size — 20 acres are required where just 10.28 are available. Cox Cro Crossing is not the only project on Route 9 before the planning board April 4. A auto garage and car sale shop at Froriep Lane, and a new drainage and parking plan for Academy Bus Lines are also on the planning board agenda. Academy Lines, at 2253 Route 9, is seeking a preliminary and final major site plan for its 10-acre parcel to have an addition of a parking lot and create drainage improvements there. Also, Fischer Auto Body seeks approval for a 4,000 square foot auto garage and care sales shop at 2 Froreip Lane – the next north corner on Route 9 after the CVS at Route 9 and 571. The site is currently a single-family residence and would be converted into a vehicle repair shop and car sales facility, according to documents filed with the township. The auto body application requires variances — the applicant is asking for nine parking spaces, where 20 would be required, for example – as well as other bulk variances for buffers, fencing, signage and landscaping. The April 4 planning board meeting agenda also has a change of use for a Hooper Avenue property. The site of an Aamco transmission repair at 1770 Hooper Avenue in Silverton, the building would have three tenants – the transmission place, a hot tub sales shop, and a kickboxing/fitness business. The proposal means more parking spaces are required; the applicant, Hooper Partners LLC is proposing a variance for 45 spaces where 50 are required. Also on the agenda is discussion on the 15-bed group home for Alzheimer’s patients at a large home at 1544 North Bay Avenue. The meeting is at 6 p.m. April 4 in town hall.